"If the earth had a voice it would be the sound of a didjeridu"
Presented by professional didgeridoo tutor Alex Murchison, using the highly successful Echo Tree teaching method. 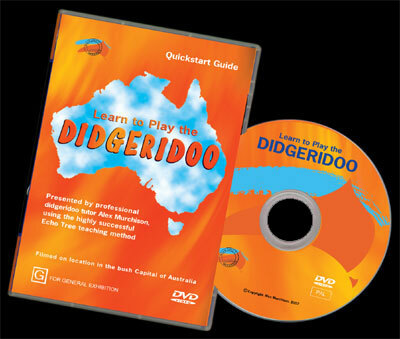 This DVD will teach you how to play the didgeridoo quickly and easily. The presentation is straightforward and easy to understand, where the sole aim is to get you playing, and to get you playing well. 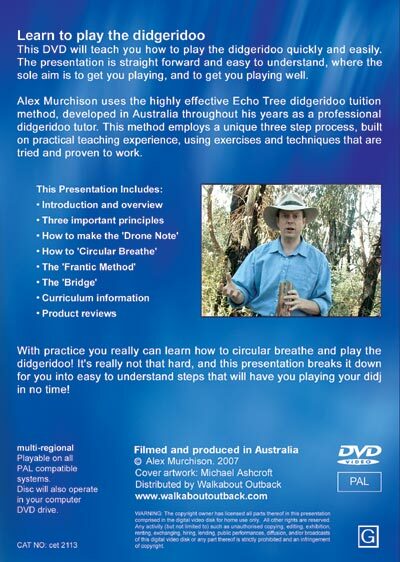 Alex Murchison uses the highly effective Echo Tree didgeridoo tuition method, developed in Australia throughout his years as a professional didgeridoo tutor. This method employs a unique three step process, built on practical teaching experience, using exercises and techniques that are tried and proven to work. With practice you really can learn how to circular breathe and play the didgeridoo! It's really not that hard, and this presentation breaks it down for you into easy to understand steps that will have you playing your didj in no time! Filmed on location in the Bush Capital of Australia. The easiest way to learn to play the Australian Didgeridoo! This website proudly supports www.cenart.net.